ThemeParkMama: Dr Woods Black Soap and Baby Mild Bar Soap Review and Giveaway! 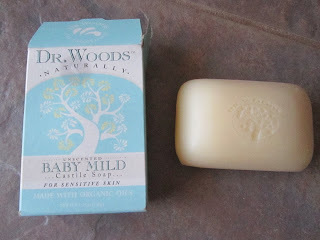 Dr Woods Black Soap and Baby Mild Bar Soap Review and Giveaway! I was recently offered the chance to review Dr Woods Black Soap and Baby Mild Bar Soap. Pure Black Soaps are vegetable based, containing no animal fat. They are natural and biodegradable, perfect for consumers who care about the environment. Black Soap contains olive oil, giving it natural healing properties and the ability to attract moisture and hold it close to the skin to form a breathable layer that prevents moisture loss. Dr. Woods Black Soap does not contain any harsh detergents that can strip away skin’s natural moisture. The Vitamin E rich lather leaves skin feeling naturally soft and clean. Dr. Woods is eco-friendly and ideal for guilt free camping and laundry. Three sizes – 8 oz., 16 oz. and 32 oz. The Baby Mild soap bar was great! I used it on my daughter Sarah. It had a light lather to it, making it stress free when placing on baby. I like that its made with organic oils, which is great for sensitive skin. The smell is gentle has little to no fragrance. Its also Vegan friendly which is hard to come by. Dr Woods offers many other options of bar soap to choose from. They also do not test their products on animals which is a huge plus. Dr Woods makes great products and I am happy to be able to review them. You have spread a lot on light on the qualities of black soap but i think that Baby Mild Soap Bar is also a must have product.